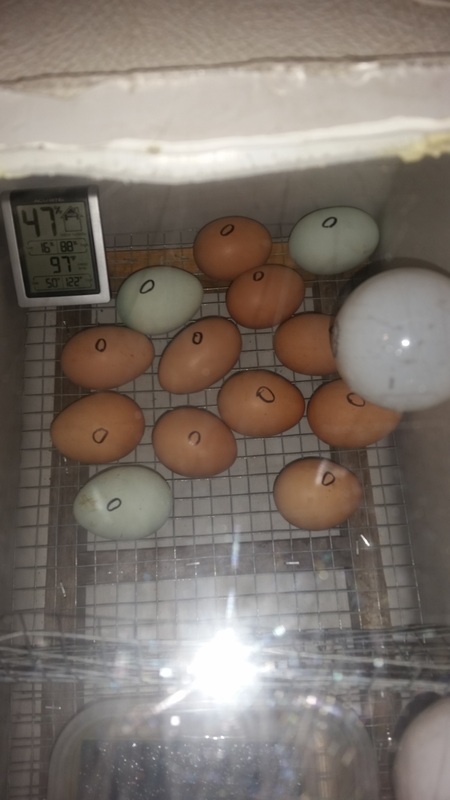 So there I was, looking at egg incubators that cost way more than they should and thinking that there was no way I was going to pay what they wanted for something so simple. Being who I am I went to YouTube and searched the internet on how to make my own incubator. I found several simple ideas and examples of what i could do so I set out to make my own. I had pretty much everything I needed to make one from scratch. 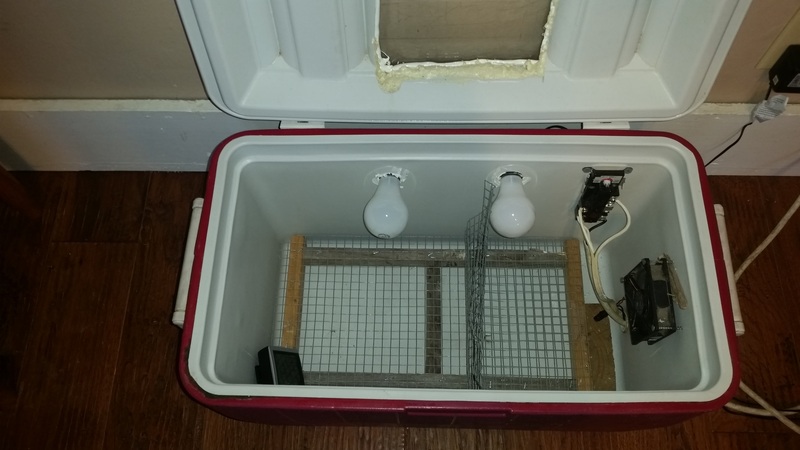 I already had an old ice chest that never gets used, plenty of old electrical wiring from other odd jobs, light sockets and light bulbs. All I had to buy was a thermometer that read temperature and humidity which only cost $10 and a hot water thermostat, another $15. Took me about 3 hours to assemble the whole thing. It took a while to get my temperature setting right with the thermostat. I cut 2 holes for the light sockets and caulked them in. 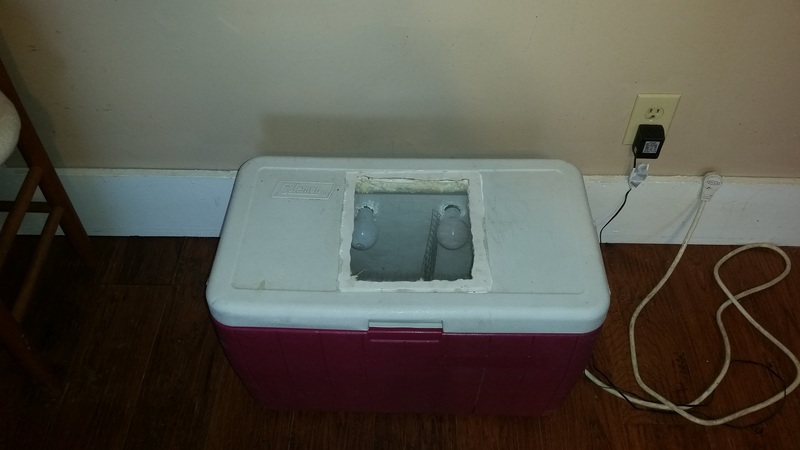 I cut a hole in the lid of the ice chest and an old piece of plexiglass to fit over the hole, caulked it in and also used spray foam insulation to fill the lid of the ice chest. Who knew the lid of an ice chest was not insulated, go figure. I took the drain plug out and that is where the wiring was ran through. Installed the thermostat and an old computer fan. Made a frame to fit in the bottom of the ice chest and nailed one quarter inch welded wire to it so the eggs could sit on it. The welded wire helps with air circulation and also helps keeps the eggs from rolling around after you rotate them. All in all I spent twenty five dollars on an egg incubator that can hold 30 eggs. I cannot imagine spending $150 to $200 on an egg incubator after making one from spare parts around the house. Yes it is easier to go buy what is already made but the more we learn how to build what we need the more self sufficient we become. We learn new skills that help broaden our working knowledge of the world around us. Americans are great at tinkering around with everything around us, always trying to improve on what we already have or to create something new and useful. Farmers can be the best at tinkering around with new and old thing to make them work just a little bit better.